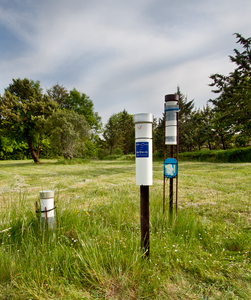 The resulting data recorded by the rain gauge, based on an OEM version of a Tinytag count logger, accurately reflects the rate at which rain falls, a parameter just as important as the total quantity of rain. The accurate monitoring of rainfall is of fundamental importance in fields such as meteorology, agriculture and hydrology, but also in specialised research fields such as palaeoclimate reconstruction using cave stalagmites, where the relationships between rainfall and groundwater flow need to be understood. Some of the obvious disadvantages of the old bottle and ruler method of measuring rainfall were overcome in the 17th century by Sir Christopher Wren who, allegedly, invented the ingenious and still widely used tipping bucket, a mechanical flip-flop which records an "event" each time the bucket fills sufficiently to tip and spill its contents. However, these mechanical devices must be made to quite high precision, and they are liable to corrode or suffer from accretions (including insects and spiders' webs) and consequent seizure. A further problem relates to the resolution of the instrument, where a fairly typical bucket volume of 5 to 10 mL equates (with a 5" funnel) to rainfall of 0.4 to 0.8 mm. Any rainfall event less than this will not be recorded, while remanent water in the bucket will influence the next recording. Sensor designer PiTech Research has used Gemini data logging technology to address these problems in its design of a pluviometer in which drops of water accumulating on the end of a wettable nozzle of fixed diameter fall onto a device which records the impact of the drop on its surface. Since (all other things being equal) the volume of a water drop is purely a function of nozzle diameter, then the frequency at which the fixed-volume droplets fall is directly proportional to the rainfall in mm per unit time. Using a sensor identical to the "Stalagmate"* (a unique logging drip counter used for cave monitoring, based on an OEM version of the Tinytag count logger), these drops are counted at intervals programmable from minutes to hours (typically 10 minutes), with a theoretical rainfall resolution of 0.01 mm. The capacity of the logger is 32k data "buckets" each of 16k capacity, giving a potential maximum of 229 (537 million) data points The resulting output is a time series which accurately reflects the rate at which rain falls, a parameter just as important as the total quantity of rain. An unusual application of rainfall measurement is in assessing the noise impact around wind farms in the UK. The sound of rain increases background noise and contaminates the signals received by the noise monitoring equipment, but a measurement of the duration and intensity of the precipitation allows noise data during periods of rainfall to be excluded. The sensitivity of the Pluvimate as compared to a tipping bucket rain gauge is particularly advantageous for this application. In collaboration with Royal Holloway, University of London, three pluviometers have been deployed since late 2009 on a site above a cave in South West France, in conjunction with Stalagmate drip loggers and Tinytag rugged Plus 2 temperature loggers in the cave itself. Plus 2 loggers are also used to monitor the outside air and soil temperatures. The pluviometers are mounted at different heights and each uses a slightly different debris filter and funnel to try to determine which configuration is best. Pluviometers are often placed in remote, infrequently visited locations, so autonomy and reliability is essential, and the 1/2 AA lithium battery generally lasts for four years or so. The essential criteria of long battery life, reliability in all weathers and value for money have been perfectly satisfied by Tinytag loggers. Their small size and low power consumption make them ideal for use in rugged field instruments such as the Stalagmate drip logger and Pluvimate high resolution rain gauge. * "Using Tinytag temperature and count loggers to monitor caves and reconstruct past climate change", D. Mattey, Royal Holloway, University of London (Tinytag information sheet).